This new skinny tie strikes the perfect balance of modern and timeless. The deep blue color gives this tie an elegant and timeless look while the monochromatic mini checks as well as the skinny cut makes this one of our more modern pieces. 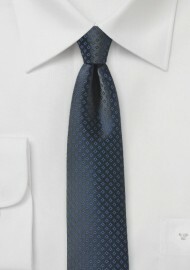 A great looking tie when paired with slim fit suits in dark navy, light gray, and tan. Also available in jet black as well as cherry-red.